Spring has arrived. It's still a bit chilly out, but the sun is out and everyone seems happier and full of hope. To celebrate Spring arriving I have a gorgeous hamper to give away to one lucky reader. The hamper has been kindly donated by serenataflowers.com. The hamper itself is really high quality and I do love the selection of goodies included, especially the natural pear drops. They reminded me of being a wee girl and my mum buying me a quarter of pear drops, which I would then share around the queue when we visited the butchers, bakers and fruit and veg shop. The wine and biscuits were very good too. I still have some chocolate and fudge left to try. 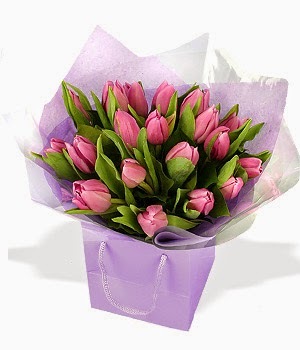 Serenata Flowers have a beautiful array of Spring flowers including my favourite tulips. As well as a huge selection of flowers, Serenata Flowers also deliver plants, wine, chocolates and hampers. They do a good deal on flowers and chocolates. Order before 10pm and they will be delivered free the next day. It's a great site and the flowers are well priced. They often have special offers on too. So do you think you would like to win a gorgeous hamper like this one? All you need to do is leave me a comment telling me what your favourite flowers are and then enter using the rafflecopter box below. This giveaway is open to readers with a Mainland UK address only and will close on 4 May 2014. Good luck everyone and hello Spring! I love roses and lillies! I love bluebells - they are no use as cut flowers but the smell and colour in a bluebell wood on a warm spring day is amazing. I love freesias, they look beautiful and smell wonderful. My favorite flowers are tulips. I love their bright vibrant colors! I love roses and their scent - I always have to stick my nose in them. Tulips are my favourite flowers! Sunflowers, they are so bright and cheerful! Leave a comment on this post telling me whatyour favourite flowers are. I love pinks and pansies. Beautiful looking spring hamper. Sister spotted those lovely rosehip biscuits selling in Bruar so they are bound to be very tasty! Arrangement has really got me thinking about edible Easter gifting for family. Pansies, sunflowers, anything colourful. Daisies are great too. Friendly flowers. Gorgeous looking hamper - thank you for the chance to win some wonderful goodies.It is so hard to pick a favourite flower as love them all, but I think if pushed I would have to say those big blousey roses, they smell gorgeous and look devine. I love all flowers but if I had to choose a favourite it would be the Oriental Lily. Not only is it a beautiful flower but the scent is divine and fills the house with a wonderful aroma when I am fortunate to have a vase of them. My favourite flowers are hyacinths. My favourite flowers are sweet peas and freesias. The combined smell is heavenly. I love gigantic sunflowers because they're really bright and cheerful! I really like gigantic sunflowers because they're bright and cheerful! Carnations and lillies are my favourite flowers. Bluebells. You know Spring has arrived when you see them! Love daisies as my kids love picking the for me. Iris"s are my fav flowers. Hyacinths as they have such a lovely scent. Freesia. I had my wedding bouquet made up of these. They smell gorgeous. I named one of cats Freesia too. Sweet Peas - the old-fashioned type - what an astonishing fragrance; it perfumes the whole garden. Sunflowers are gorgeous and always make me happy and optimistic! Bluebells - carpets of them in woodland - beautiful ! Night scented stock, just for the pleasant smell on a balmy evening. Pansies. They look so lush and velvety.